Forklifts are one of the most powerful vehicles for builders. Whether you need to move heavy loads in a warehouse or construction field, forklifts can safely lift objects humans cannot, making them indispensable on any job site. Since there is a wide selection of styles and models, it can be difficult to select a forklift. 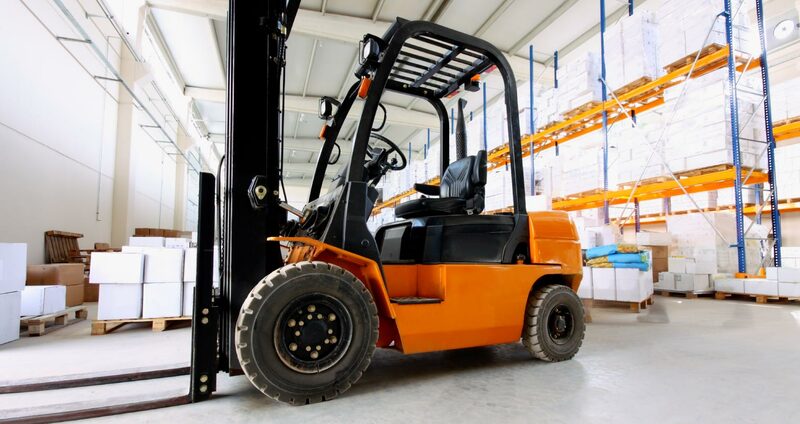 Whether you’re looking to rent a forklift for your next project or purchase one, our guide covers the different forklift types, the benefits of each equipment, and popular forklift models to help choose the right forklift for your needs. We’ll cover below what each forklift is, what it’s best used for, and popular manufacturers and models. The warehouse forklift is the most recognizable type of lift truck. It resembles a yellow golf cart with twin forks extending from the front. You’ll most often use this forklift in a facility with a large number of items in inventory. These trucks are great for loading and unloading pallets and balanced materials, well as removing and transporting items from delivery vehicles. Some of the most popular warehouse forklift models include the Hyster 36-38T, Komatsu 20 BX50 Hyster, and the Toyota 3-Wheel Electric Forklift. Most industrial forklifts can lift 5,000 lbs of weight, but some heavy-duty models are capable of elevating up to 25,000 lbs. There are a few subtypes of the warehouse forklift, including the side loader and counterbalance forklift. A subtype of the warehouse forklift, side loaders are usually found in steel service centers and manufacturing facilities with heavy and bulky items. The operator stands in a sideways compartment and the side loader unloads objects on its side. Due to its sideways operation, side load forklifts can easily drive up alongside racks and load and unload without having to turn. This makes them suitable for navigating narrow aisles and handling long loads like timber and pipes. Toyota, Raymond Corporation, Yale, and Hyundai are some of the top brand manufacturers of side loaders. The counterbalance forklift is a popular lift that features forks in the front and a weight in the back of the vehicle to counterbalance the weight of the load. Counterbalance forklifts have no extending arms, giving them the ability to move directly to the load. There are a few different types of counterbalance forklifts. The 3-wheel variant is ideal for situations requiring the operator to turn and maneuver in circles. The stand-up counterbalance forklift allows operators to easily hop on and off between loads. Popular manufacturers include Mitsubishi, Toyota, and Crown. Also known as a telescopic forklift or a reach forklift, the telehandler has a boom and extendable arm, making a combination of a crane and forklift. The twin forks attached to this arm are used to move pallets off the ground. A standard telehandler is capable of lifting 5,500 lbs of materials from up to 19 ft in the air. These material handling trucks are great for reaching into tight spaces and odd angles. Because of their growing popularity, manufacturers like JCB, Genie, Bobcat, Haulotte, and Caterpillar produce a variety of high-quality telehandlers. Models like the JLG 1644 are adept at larger capacity jobs, while other models can lift loads up to 55 ft high. The industrial forklift—also called a large capacity forklift—combines the functionalities of a warehouse forklift with that of a telehandler. While it can’t reach difficult angles the way that a telehandler can, it is capable of lifting payloads much higher off the ground than a warehouse forklift and heavier loads. The industrial forklift starts with a 30,000 lbs maximum lift. However, you only need such power on specialized jobs. The industrial forklift’s utility is narrow in scope compared to the telehandler and warehouse forklift. There are 20 popular forklift manufacturers on the market. Big names include NACCO Industries and Mitsubishi, and some of the popular models boast an impressive capacity of 36,000 lbs. Also known as a straight mast forklift, the rough terrain forklift is designed specifically for outdoor job sites, especially on uneven surfaces. These truck have sturdy pneumatic tires that help them navigate rocky ground. The special tires are oversized and threaded, giving them better balance and stability to safely transport materials. If you do most of your work indoors it is unlikely that you’ll ever need one, but rough terrain forklifts are a must for outdoor applications and construction sites. Popular models include the JCB 950 and CASE 588H with four-wheel drive options. Another big perk of rough terrain forklifts is that they can lift big models — most models have a capacity of 6,000 lbs and 8,000 lbs. Pallet jacks are specialized in nature. Also known as pump trucks, these forklifts aren’t capable of lifting large loads due to their small size. In exchange for power, pallet jacks have a small footprint, allowing them to fit into the tightest spaces and lift small loads in tight quarters. While you sacrifice power and maneuverability, the acquisition and renting costs of a pallet jack are much lower. Popular pallet jack models include the Mighty Lift 20 x 36 inch Pallet Truck and Vestil Electric Pallet Truck. Buyers or renters can choose a manual pallet jack or electric pallet jack. Walkie stackers are strange in appearance and specific in utility. Unlike other forklifts, these material handling vehicles don’t have cabs. Instead, the worker walks behind the stacker and steers it by using an attached handle. Like a pallet jack, these units lack power, maneuverability, or speed. However, they are ideal for situations where you need a taller pallet jack. The walkie stacker reaches much higher off the ground than its counterpart. Current walkie stacker forklift manufacturers include Hyster, Jungheinrich, and Toyota. Toyota’s 6BWC20 is ideal for 4,000 lb loads, while Jungeinrich’s EMC 110 is suited for narrow aisles. An order picker is a subtype of the walkie stacker, used to pick and deliver materials from storage. Reaching heights of up to 32 ft, these machines are designed to lift operators up to warehouse racks and carry individual units. They are for customer order warehouses and storage facilities since they can pick one or two units rather than bringing down full pallets and loads. Their versatile design means they can handle items of various sizes, from auto parts to furniture. The reach forklift is a warehouse truck used mainly for indoor work. Its key ability is that it can extend its forks beyond the compartment and reach into warehouse racks in a way that standard forklifts cannot. It also features an open compartment that allows the operator to have greater visibility. While excellent for indoor use, reach trucks for not suitable for outdoor work due to their under-carriage clearance. UniCarriers, Clark Materials, and Yale manufacture some of the most high-quality reach forklifts. Most forklifts contain either a traditional internal combustion engine or an electric motor. They are also equipped with either “cushion” tires — tires made of mostly solid rubber — or pneumatic” tires, which are tires filled with air. The right tire will depend on the type of work. Pneumatic tires are better at handling larger capacities while cushion tires work best on smooth surfaces. Forklifts range in size depending on their function. Although they are versatile machines, you’ll need the right size for the job. Standard forklifts generally measure between 4 to 7 ft wide and 8 to 10 ft long. Outdoor or rough terrain forklifts can be greater than 10 ft in length. Narrow aisle forklifts like walkie stackers and side loaders can measure less than 5 ft. However, if you are using a forklift in a warehouse setting, it is important to consider the aisle width. Standard counterbalance forklifts require aisles of approximately 13 ft wide to effectively turn, navigate, and move pallets. Another measurement to consider is height. Most standard forklifts can reach heights between 10 and 15 ft, but special forklifts like the telehandler can lift as high as 55 ft depending on the telehandler size you select. While size plays an important role, forklifts carry an impressive amount of weight due to their special design. The key elements of a forklift are its lift capacity, load center, and stability. Forklifts have varying abilities in each category, which must be taken into account when choosing one. The lift capacity is the amount of weight that a forklift can carry safely. This amount also plays a key factor in the vehicle’s stability — a forklift that carries too much weight isn’t stable. The load center is the distance from the forks to the center of gravity of the load. The amount varies depending on the weight of the load, the lift angle, and the tilt angle. As a forklift operator, you don’t have to worry about the load center as long as you respect the listed weight capacity and keep the load balanced. The stability triangle is an area under the forklift. It maintains the center of gravity needed to prevent the vehicle from tipping over. This triangle explains why you don’t worry about the load center. The truck’s design does that for you. Determine the capacity. How much weight do you need to lift? Calculate the weight of your job site. Can the ground sustain the forklift? Measure the height of the space. Can your forklift pass through openings? Select the correct fuel type. Do you need battery power or gas? Analyze the terrain. Is the surface smooth or uneven? Forklift types vary in several aspects, from their fuel type and tire composition to their lift capacity and height. It’s important to consider these different factors when selecting a forklift. With their ability to lift and transport things of various sizes, forklifts are valuable players on any job site.